The Kapitelschwemme is situated at a prominent spot in Salzburg: On Kapitelplatz Square, just between the Erzbischöfliche Palais (Bishop′s Palace), the Salzburger Dom Cathedral and the access area to St. Peter′s Abbey, the ancient Benedictine monastery. 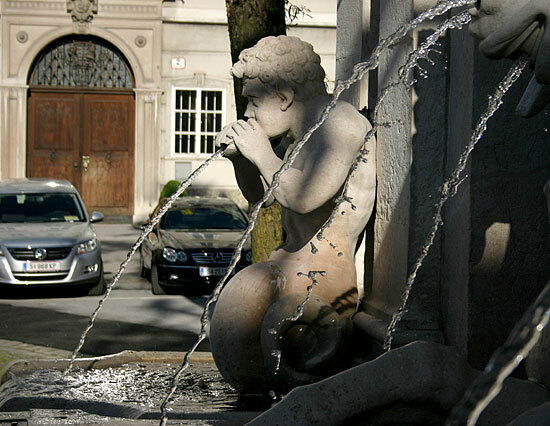 Despite of its splendid Baroque, the Kapitelschwemme fountain fulfilled a rather profance purpose: The horse carriages of the city used it for providing horses with water and to wash them. Therefore, the Kapitelschwemme Fountain has a shallow access ramp.